One of the most common worries I hear from my clients is that they are somehow failing. Failing at mothering well enough, failing at taking care of their own health, failing at nurturing their relationships. If they run a business, they fear they are failing at that, too. They want to be Supermom, but they aren't.It is easy to believe that, if you look at all the messages that come to us here in the West. We look around at the media and assume we must be happy, slim, healthy, delighted to see our children and our partners always, full of scintillating conversation, eager to cook Pinterest-ready dinners and adorable bento-box lunches. That's the Supermom standard. You snapped at your kids 5 out of 5 mornings on the way to school. You've perfected the messy bun because you haven't showered in a couple of days, let alone shaved or put on cute underpants (have you even have cute underpants? You might still be wearing the post-maternity ones, and they have holes). You cope with the evening crazy with a glass of wine or two and you fall asleep on the couch almost every night. You haven't seen the end of your to-do list since ever. "Supermom" feels pretty far away right now. You're pretty sure other moms have it figured out, but not you. The truth is, most of us struggle more than we are likely to admit. We put on a brave face, but we definitely don't have it figured out It is hard to be a mom in this society. It is not staked for our success. We don't have enough childcare, if we can find quality caregivers at all. We don't make enough money, and even our most supportive partners really don't carry half the work.But that doesn't mean that we can feel like Superwoman in our own lives. We just can't do it by following the common standard. We have to make our own. How much time and attention do you have? The hardest part of the Supermom image is that she seems to do everything. This is the first myth to let go, if you want to create your more successful standard. I'm as feminist as the next Gen X Californian woman, and I do believe that women can do anything. But what we can't do is everything all at the same time. How do I make space to single parent and run my own business? My house is a mess a lot of the time. How do I make time to cook from scratch often? I only cook once or twice a week and we eat a lot of leftovers. I don't pack lunches, I don't go on many field trips, I don't see my friends as much as I'd like.I pick and choose, in other words. Our culture's expectations are heavy, but we moms make that worse by beating ourselves up constantly. Didn't remember to put a note in your kids' lunch boxes? Bad mom. Not volunteering for the PTA? Bad mom. Not excited about signing your child up for the third extracurricular activity this month? Bad mom. I object. Creating a life and a home that is peaceful, calm, and nurturing makes you an excellent mom. And if all of those extra things are causing you stress and angst, so that you can't support that peaceful, calm, nurturing environment? Then cutting them out does not make you a bad mom. 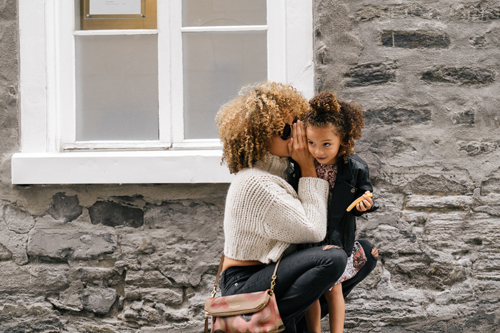 You know what is right for you and your kids, even if you need some practice listening to that little voice to hear it more clearly. Trust yourself a little more and criticize yourself a little less. I clearly remember my therapist once inviting me to consider how I could be a "good enough" mom. I looked at her like she was crazy. Why would I even want to do that? I left my career to be a mom. Being a mom was my whole life! Why would I want to only be good enough at it? With the perspective of a few years (during which I realized I was the one far closer to crazy than she was), I have a different perspective.Now I aim for being Good Enough Mom pretty regularly. Because letting "being a mom" be my whole life was unsustainable. Because Perfect Mom is unattainable. Because when I'm trying to be Supermom, I pretty much hate my whole life. There are other things I want to do with my time and energy than constantly be striving for something that I will always fail at, and then beating myself up about it. Because that sucked. Now I aim for awesome moments, as often as I can, and let the background be all about good enough. Where are you rocking your life, just like it is? Maybe you are on deck advocating for your kid who needs a little extra help and understanding in the classroom. Maybe you are totally confident in your ability to make your kids laugh so hard they snort any time you wish. Or you and your partner have really solid communication right now, because you've been working on it, and it shows. Or you just made a big sale, or landed a new client, or just feel like you are showing up in your work completely you. Give your self credit for all the ways you are amazing in your life right now, flaws and messy hair and holes in your underpants and all. You don't have to be super on all fronts. We all have our individual super powers. But if you are always looking outward at what other expect of you, you will never have time to look inside at what you are amazing at already, and how you are already making an incredible difference in the world and in the lives of your kids.